The struggles of a woman when she voices against the system, the powerful and the government at the backdrop of Emergency era. What all a wretched woman goes through when she decides to raise her voice against the atrocities and tyrannical policies of the government during the period of emergency. 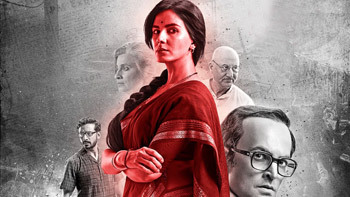 Positive Points: Convincing performances, powerful dialogues and, above all, competent direction by Madhur Bhandarkar. Negative Points: The pace of the film could have been a little faster. Kriti Kulhari Interview: I don't want to do five films in a year; I am choosy!